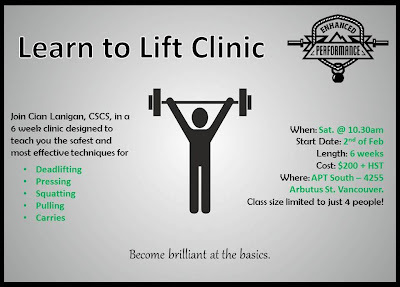 This clinic is for anyone looking to learn or refine proper technique in order to get maximum benefits from free weight strength training. 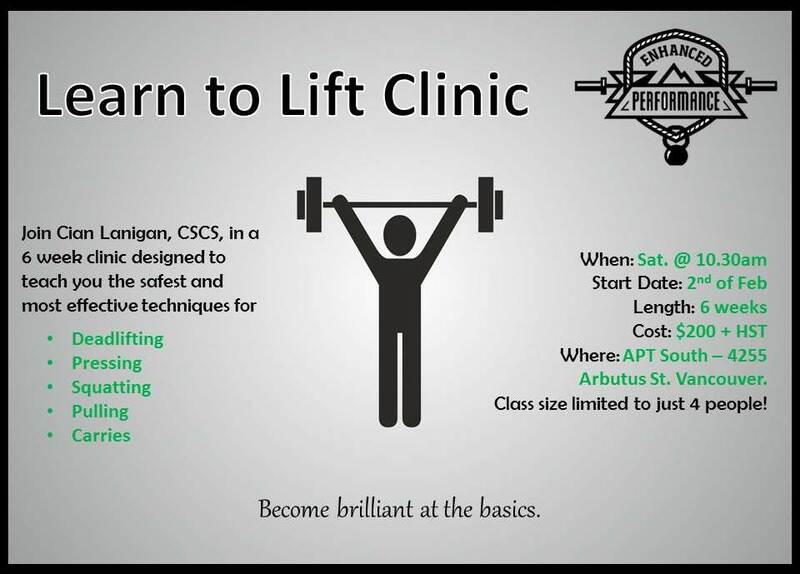 If you have not spent time with a technical coach in the gym this clinic is for you. We will focus on the common movements such as the hip hinge, squat, push and pull patterns as all strength training exercises are variations or combinations of these. For example, the technique to perform a push-up is very similar to a bench press or shoulder press. Yes, there are subtle differences, but once you learn how to press you can apply that knowledge to a variety of different pressing exercises. More than anything this clinic will focus on teaching you the proper techniques rather than a variety of exercises. For example, packing your shoulders, rooting your feet and stabilize your core are necessary techniques in nearly every exercise you’ll do. It’s about leaning a skill set that we will practice applying in the primary movements. From there, you can take that knowledge back to whatever type of workout you would like to do. A 60 minute class every week. The clinic will run for 6 weeks. Participants will also receive “The Fundamentals”, a 10 page e-book which summarizes all the basic techniques and movements we will cover in the clinic. I’ve limited this class to just 4 people. The reason for this is to maximize the amount of personal coaching you will receive. Although we’ll be covering the fundamental techniques and movements, how everyone applies these to their own body will vary slightly due to past injuries, flexibility restrictions etc. I want to make sure that everyone attending will have enough personal coaching to adapt the general techniques and movement to the own unique body. I am a certified strength and conditioning specialist (CSCS) with a bachelor in sport and exercise sciences. However, far more important than the letters after my name is the fact that I am, and have been for the last decade, extremely passionate about training. This passion has taken me to several workshops each year where I’ve had the privilege of leaning from some of the best in the industry. I've trained under some great coaches too. This is my passion in life, and I can confidently say that although there is more for me to learn, I am very good at my job. If you leave this clinic without feeling confident in your ability to safely perform a basic strength training program with good technique I will give you a full refund. I would love to attend but the day/time doesn't work. Email me with your preferred times. If 3 people email me with the same time I will run another clinic. Organizing a group (3-4 people) with friends or co-workers would be a great way to get your preferred times.